The great tenor saxophonist Stan Getz was recorded on three occasions at San Francisco’s Keystone Korner, the so called Birdland of the West, that for eleven years hosted the greats of the music that performed there. Todd Barkan the club’s owner fortunately recorded the performances on the house sound system, and over the ensuing years many of them have been released. As part of Resonance’s ongoing series of never before released archival finds, earlier this year two Getz albums from a single week were brought forth, adding worthy additions to his voluminous discography, “Getz/Gilberto ‘76”, and “Moments In Time”. 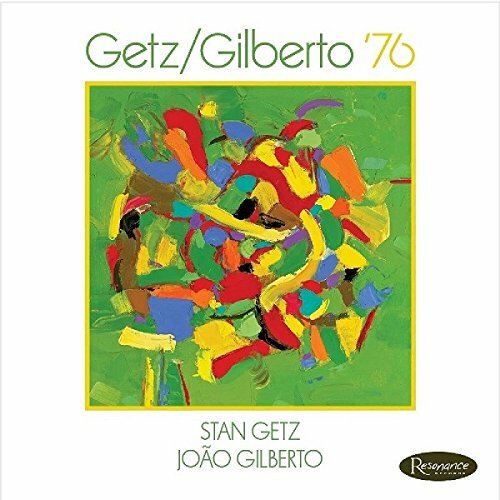 Getz/Gilberto '76 is the third album to showcase the partnership under Getz and vocalist/guitarist Joao Gilberto following the classic trendsetting “Getz/Gilberto” (Verve, 1964) and it’s follow up the live “Getz/Gilberto” #2”(Verve, 1966) and is every bit as charming as the previous two albums. Getz’s quartet with Joanne Brackeen on piano, bassist Clint Houston and drummer Billy Hart, previously featured on a date for Steeplechase played a week at the Keystone Korner, one set by themselves, and then the following set joined by Joao Gilberto, concerts supporting the release of “The Best Of Two Worlds” (Columbia, 1976). The chemistry between the saxophonist and the vocalist is truly special, Getz’ famous behind the beat phrasing was the perfect compliment to Gilberto’s slippery delivery which somehow seemed to float behind and ahead the beat at will, qualities amply demonstrated on “E Preciso Perdoar” featuring a passionate Getz solo turn, the poetic Jobim classic “Aguas de Marco” (Waters of March) where the slick lyrical content favors Gilberto wonderfully. Gilberto’s singular guitar work is well highlighted on the ode to his son, “Joao Marcelo”. Whether it’s duo’s, trio’s or numbers featuring the full quartet, everyone is completely in tune with each other, in the excellent lengthy booklet, Billy Hart details the lengths he went to with Gilberto’s tutelage to authentically capture staple Brazilian rhythms at the same time, play them with the looseness of Elvin Jones or Tony Williams, and throughout Hart renders them with unflagging sensitivity. A beautiful addition to the timeless Getz/Gilberto discography. Moments in Time is the companion culled from the same week of shows, and no less engaging. Getz’ quartet with Joanne Brackeen, Clint Houston and Hart is such a strong one because of how adept they are at listening, creating inner dialogues in the music to offset Getz’ lyrical lines, and also truly pushing him to greater heights. “Summer Nights” the classic standard jumps right out of the gate with surging swing, with the saxophonist simultaneously reflective and smoldering through his series of choruses, totally rhythmically flexible. Joanne Brackeen’s solo with her strong Hancock and Tyner influence is evidence of her absolute comfort in inside or outside settings, and the inside out tension is perfect for Getz throughout. Wayne Shorter’s “Infant Eyes”, initially captured on “Montreux Summit” (Columbia, 1977) receives one of it’s first readings by Getz here. His tender, pillowy tone perfectly captures the gentleness of Shorter’s enduring melody, the saxophonist investigating it’s crevices with heart breaking beauty. Dizzy Gillespie’s standard “Con Alma” is also a standout, Billy Hart’s double time sprint halfway through the tenor solo, twinkles like embers being sparked in the midst of a winter campfire. “Moments in Time” captures one of Stan Getz’s finest later quartets, their decidedly post bop edge invigorating and challenging him at every moment. Both albums as is typical of Resonance are housed in beautiful gatefold digipacks with booklets featuring essays and interviews offering thorough documentation of these previously unreleased recordings and where they stand in the Getz discography.